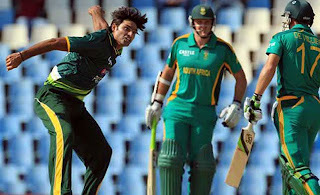 Pakistan is 2-1 down in five match ODI series against South Africa. Third test match between Pakistan and South Africa was a very interesting match in which we seen some awesome performances like 88 of Afridi and centuries by Hashim Amla and AB de Villiers. In the end South Africa won the match by 34 runs. Now Pakistan needs to win both the remaining matches otherwise they will lose series to host team. 4th ODI will be played on Thursday 21st March in Kingsmead, Durban. All eyes will be on Shahid Afridi who has shown great batting performance in last two ODI matches. Pakistan may drop Abdul Wahab Riaz and bring Umar Gul back in the side. According to Cricket experts Pakistan should choose batting first after winning the toss because Pakistan's record is not good in chasing the target.